Compared to most people, Noah Lewis dresses differently when he goes to work. Where many people wear work pants, dress slacks, or a nice blouse, Noah adorns his 16th century regimental coat and feathered cap. 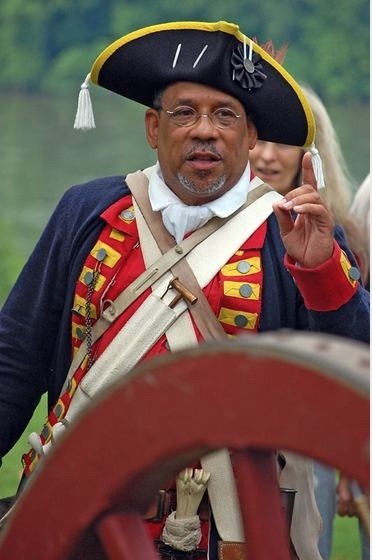 He is a full-time re-enactor, spending his time in costume and character educating people about the important role Black people played during the revolutionary war. During the war, between 3,000 – 5,000 people of color served the American cause, and 7,000 – 10,000 would serve the British. For the past 15 years, Lewis has participated in the staging of Washington crossing the Delaware River at Washington Crossing Historic Park. He does not portray anyone specific in that re-enactment, but is a representation of Washington’s integrated army. While doing research into his own genealogy, he learned about a Continental Army soldier named Edward “Ned” Hector, a Black teamster and artilleryman who fought in the battles of Brandywine and Germantown in 1777. During the battle at Brandywine, Hector was able to secure his wagon team and armaments before they could fall into British hands during the retreat. After becoming engrossed in learning about him, Lewis decided to re-enact full-time as Ned Hector. Before he began re-enacting, Lewis had no idea that Black people had played such a monumental role during the war. “I did not realize I would gain a deeper appreciation for the struggles of America’s other cultures. I was surprised to find our diverse ethnic struggles were mostly the same replay of our common struggles of the human condition. Things like, one group of people taking advantage of others for their own benefits….The rationales we use so we can live with ourselves and look our fellow humans in the eye,” said Noah. Since his first presentation, Lewis has learned a lot about the individuals who helped shape our nation. He hopes that everyone will embrace the history of Black people as their own, and as part of American history as a whole. Learn more about Ned Hector and Noah’s re-enactment of him at his website. Know of a good natured Pennsylvanian who is passionate about outdoor recreation and/or conservation that we should feature? Contact DCNR by sending email to: ra-resource@pa.gov to nominate someone. For more information on state parks and forests and recreation in Pennsylvania, visit DCNR’s website, Visit the Good Natured DCNR Blog, Click Here for upcoming events, Click Here to hook up with DCNR on other social media-- Facebook, Twitter, YouTube and Flickr.